Posted on September 18, 2014	by Katy K.
My audiobook listening seems to have been a lot of teen books of late. Here are a couple of them. Boston Jacky. 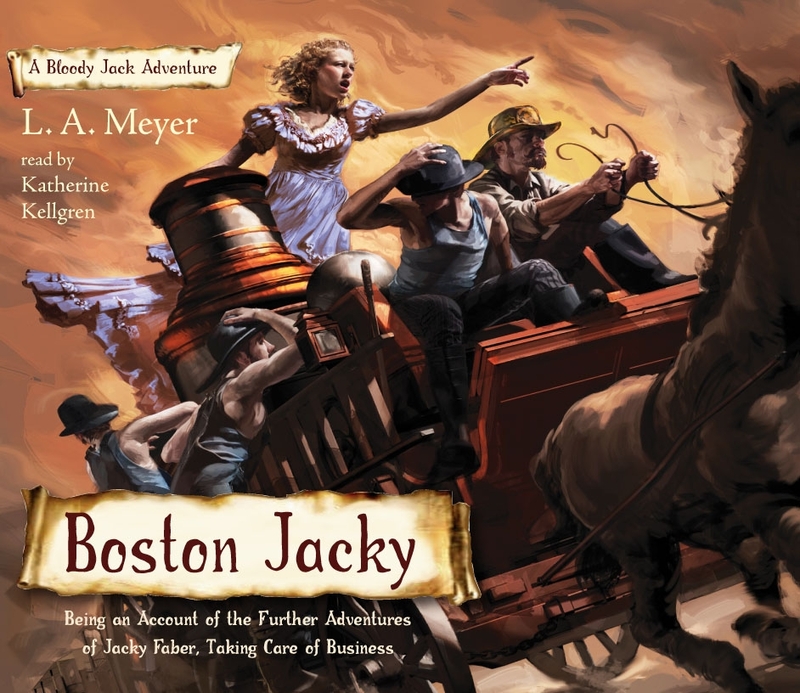 Bloody Jack Book 11 by L.A. Meyer. Narrated by Katherine Kellgren. HMH Books for Young Readers, 2013. Jacky finally returns to Boston, hoping to make it a permanent home and that her beloved Jaimy will soon return to her. Unfortunately, there are enemies old and new in Boston, and a lot of people who don’t like the large numbers of Irish immigrants she’s been shipping over. She finds herself involved in the politics of rival subscription firefighting crews, some of them not above setting fires to prove the point to people who don’t subscribe to fire protection. Jaimy arrives, but decides he’s unsure of Jacky’s loyalty and hides his presence from her. This was probably my least favorite entry in a series I’ve really enjoyed. There was too much politics, too much of Jacky’s supposed friends treating her cruelly, too much heartbreak, no real romance. Jaimy seems less and less like a person I’d want her to end up with, being so upset at her flirtations with other people when he’s gone farther himself more often, except that finding her a new romantic partner this far into the series also seems unpleasant. I listened to it all the way anyway, trying to let go of these things and enjoy the Jacky adventures that remained and Katherine Kellgren’s wonderful narration. I’m invested enough in this series that I’m sure I’ll go on to the last book in the series, Wild Rover No More, which is coming out in November. Hopefully there will be a happy ending to the series! Finnikin of the Rock. Lumatere Chronicles Book 1. by Melina Marchetta. Read Jeffrey Cummings. Brilliance Audio, 2010. This is a series that I’ve been wanting to get to for a long time. 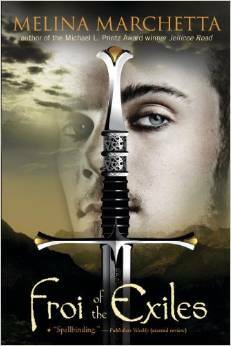 I’ve read several of Melina Marchetta’s realistic fiction books, and heard such good things about this that I couldn’t imagine not liking this fantasy series as much or more. Ten years ago, during the Five Days of the Unspeakable, the kingdom of Lumatere was overthrown. Its royal family was slaughtered and most of the population driven out and kept out by a magical barrier while an imposter king took over inside. Finnikin is the son of the former chief of the king’s guard, raised together with Prince Balthazar and Balthazar’s cousin Lucian, while the annoying younger princess tagged along. Shortly before the takeover, Finnikin and Lucian had vowed on their own blood to protect the royal family at all costs. Now, his stepmother dead and his father imprisoned, Finnikin has been trained by his father’s friend Sir Topher to act as a leader among the now oppressed exiles of Lumatere. When he receives a message from a young novice that hints that Balthazar might still be alive after all, he and Sir Topher travel to meet the novice immediately. But the novice Evanjalin is not what he’d been expecting. The two are constantly at loggerheads, and she is insistent that he stop working to improve the treatment of the exiles and instead work to retake Lumatere. It took me a while to warm up to this book. Finnikin is one of those arrogant teen boys that teen boys seem to love and who just irritate me. Evanjalin is slightly better, but they still have that kind of relationship where they will only hurt each other, both physically and verbally, without being able to tell the other person they care about the other. I was feeling this way even though the world building and the basic plot were good. The reader, while perfectly competent, gave a lot of the characters annoying nasal voices which were hard to listen to. Halfway through the characters started to treat each other somewhat better and I got more invested in the story. I finished the story liking it quite well – and everyone seems to think that the second book, Froi of the Exiles is much better. I need to read that one next for sure, but this is still a series I’ll keep in mind for our teen epic fantasy fans, who likely will not be bothered by the same things I was. This entry was posted in Books and tagged teen audiobooks, teen fantasy, teen historical fiction. Bookmark the permalink.